Educated Cheese: Holy crap baseball starts in 2 days. Holy crap baseball starts in 2 days. I've been in kind of a weather funk as of late and today I pulled myself out to see that there is some sort of actual baseball that will be played in less than 48 hours. Sure the game will be abbreviated in every possible meaning of the word but it's still baseball. Ground balls, pop ups, for Christ sake in 2 days we might see a f*cking hit and run. Do you know how long I've waited for a hit and run? Too long. Far too long. In less than 2 days it's going to be baseball season. Try to get your head around that one. Now for what seems like my nightly movie post. 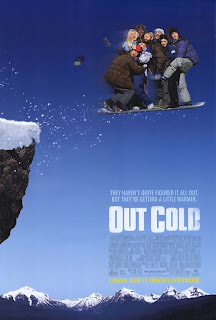 For some reason Out Cold (the best movie featuring the state of Alaska) was on the Encore Love channel. Yes I love this movie, but I'm not really sure why Encore Love would show it. If you haven't seen the movie (may a piano fall on your head) there is very little love in it, besides the love between a man and a hot tub or mechanical bull. Maybe I shouldn't be looking for a reason for the movie to be on, but take it as a sign that this snow crap all over the places means I should go snowboarding. I smell a non-scheduled sick day. Encore Love channel is getting in my head... and I like it. Ok, dude, I'll read the Cheese... but I AIN'T adding Encore Love to My Favorites. No clue why it was on that channel and now I expect Caddy Shack to be on next or something. Because, you know, Out Cold is the Caddy Shack of snow. Sure.